I don’t know why, but the name ‘Cruskits’ is just very unappealing to me. It conjurers up some sort of blend between a mouldy old crust of bread and an Airfix model. 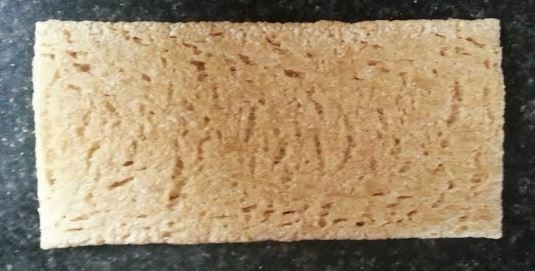 I recall that biscuits similar to this were called ‘crispbreads’ years ago, and when they first appeared on the supermarket shelves seemed very exotic and exciting. I seem to recall we had them a lot for a while, and then never after that – a bit like toasted sandwiches out of one of those machines that makes them into little sealed triangles. 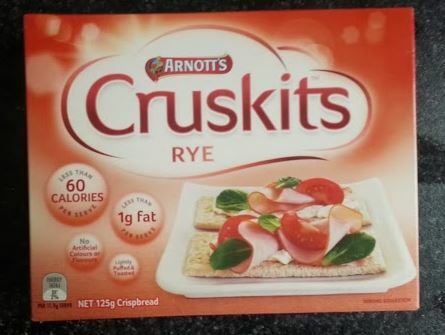 The main selling point of Cruskits seems to be their low calorie – low fat characteristics, although the fact they are ‘lightly puffed’ also gets mentioned rather lower on the billing. The idea, of course, is to load up your low calorie biscuit with lashings of full fat cream cheese, ham, avocado and mayonnaise, delivering a sense of abstemiousness whilst not actually suffering any real sacrifice. They are quite large, and suitable for this kind of snacking. Eating them on their own is a soulless experience, however. They are dry and uninteresting, tasting vaguely of nothing at all and sort of crumble away to puffy dust in the mouth. Maybe the name isn’t such as bad fit after all. I’m going to give them a two out of ten.